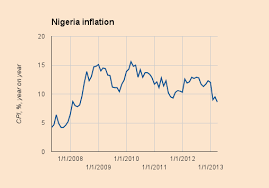 Financial experts’ predict further drop in inflation rate – Royal Times of Nigeria. Some financial experts have expressed optimism that the nation’s inflation figure will continue to slow down with enhanced stability in the foreign exchange market. They spoke in an interview with newsmen in Lagos while reacting to March inflation figure. A Professor of Economics at the Olabisi Onabanjo University, Ago-Iwoye, Sheriffadeen Tella, noted that the current inflation was fueled by exchange rate variability in the foreign exchange market as well as the country’s import dependent economy. He however said that the figure will continue to drop if the Central Bank of Nigeria (CBN) is able to reduce foreign exchange differential in the country. Dr Uche Uwaleke of the the Head of Banking and Finance Department, Nasarawa State University Keffi, also said that the inflation rate will trend further downwards in the wake of favourable developments in the international oil market in the coming months. The National Bureau of Statistics reports that inflation figure dropped to seventeen-point-two-six per cent in March from seventeen-point-seven-eight per cent in February.